This entry was written by Sarah Jenkins, posted on 08/09/2015 at 10:59 pm, filed under Youth 2015 Tour category. Our day begins with breakfast at the Gloria. The food is well prepared, and the view is wonderful. Afterward Mark Jenkins and Austin Aker spent some time on the rooftop praying and spending time with God. This location is beautiful – right in the middle of the old city. We start the day with a walk on the ramparts of the walls of Jerusalem. This affords us a rare look at the city and surrounding areas. We follow the walls from the Jaffa Gate all the way down to the Dung Gate of the old city. When we arrive at the Dung Gate, we go to the Kotel – more commonly known as the Western, or Wailing Wall – to pray. This is a time we encourage prayers for the peace of Jerusalem. Already on our journey we have encounterd soldiers of the IDF. Our group has been actively handing out Psalm 91 bandannas, provided to us by Hope for Israel. They are readily accepted and the soldiers genuinely seem to be moved by the gesture. 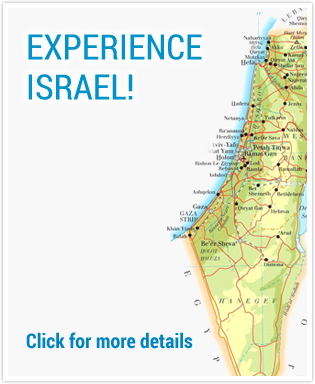 After the Kotel, we visit the Davidson center, which is a museum about the Temple Mount. We see artifacts and illustrations that help us understand the history of this place. After we leave the museum, we walk over to the Western Wall excavations, which reveal a street at the time of Jesus. We walk on the actual stones He walked on as He was led from the house of Caiphas, the high priest, to Antonia’s Fortress where Jesus would stand for judgment before Pontius Pilot. We see a pile of stones cast down from the Temple Mount. These stones represent the fulfillment of Jesus’ prophecy that the temple would be destroyed. We can actually see and touch the truth that is His word. Next, we vist the Southern Steps, which takes us along what would have been the pilgrims path onto the Temple Mount. There are a series of Mikva there. These ritual baths are for those coming to Jerusalem for the pilgrim feasts. Many scholars believe that these baths are used at Pentecost to baptize those 3,000 new believers when the Holy Spirit was poured out on Jesus’ followers. We realize that it’s Sunday, and we are standing at a significant birth place for the early church! After our visit to the Southern Steps we are treated to a lunch at the Nissan Brother’s shop. This is a very nice gesture for our group of youth on a budget. We are greeted by Elijah Nissan, who offers us a prayer and blessing for our lunch. The Nissan brothers are Christians from Bethlehem the operate a shop in east Jerusalem. 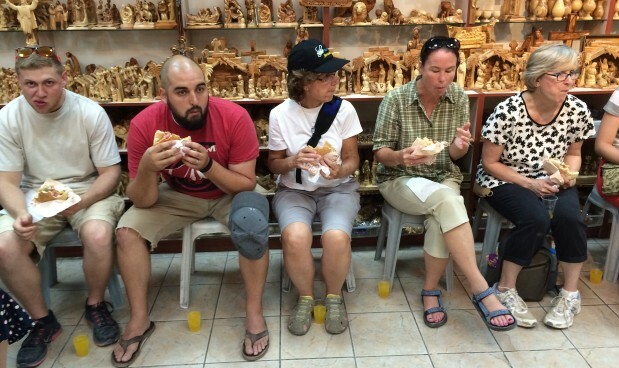 They make the best olive wood gifts in Israel, and over the years they have become friends of our tours. They were happy and gracious to host our youth. A couple of our group did purchase a nativity for family back home. We left the Nissan brother for the City of David. Yuval provided an excellent overview of the city, and that gave us some new perspectives of David’s life. We watched a film and then toured the grounds before entering a water tunnel known as Hezekiah’s tunnel. This was amazing. All of the group elected to walk in low-ceilinged tight spaces and through water, with only the lights we brought with us. Everyone did very well. Terrie Jenkins made a friend in the tunnel – a young Jewish girl from France, who spoke no English, forgot a light for her journey through the tunnel. Terrie teamed up with her and shared her light to make it through the tunnel. The girl was so tickled, she gave Terrie a kiss after we made it through. After the City of David, we return to our hotel. This evening after dinner, Mark Jenkins will guide a walk about the old city.